Chef Orlin Godfrey started his career in Rocky Mountain House, at 19. Orlin moved to Vancouver and attended the culinary arts program at Vancouver Community College before beginning his apprenticeship at The William Tell Restaurant. He continued to work in the vibrant Vancouver culinary scene for 16 years. Orlin made the Okanagan Valley the next stop on his culinary adventure to get closer to his connection to the land and the bounty it provides. 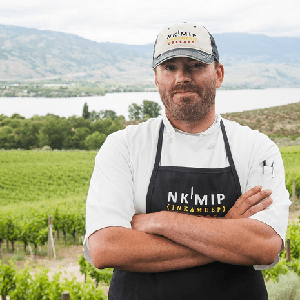 He found a home at Miradoro Restaurant at Tinhorn Creek, and in 2016 became Winery Chef of Nk’Mip Cellars. His cuisine is inspired by local produce and influenced by traditional Aboriginal techniques of the Okanagan people.